PLEASE NOTE: If you are trying to use or access the library databases remotely, please have your Enfield Library card number ready. When it comes to auto repair, “DIY-ers,” students and automotive enthusiasts have trusted Chilton repair manuals for years. Now these authoritative manuals are available in a simple-to-use, online resource that’s available 24/7 where ever there’s an internet connection. ChiltonLibrary helps DIYers save time and money with their auto repairs for both domestic and import vehicles. For business researchers, Gale Directory Library is the essential tool for research and marketing alike. A treasure trove of 51 trusted directories on companies, publishers, associations, and more—sources that cannot be found elsewhere on the Internet. With expanded data and state-of-the-art search and export features, data sorting, filtering and exporting is easy. This business database contains comprehensive information on 14 million businesses and includes the listings from more than 5,000 residential telephone directories. Highlights content relevant to teachers, including lessons plans, curriculum standards, and other professional development resources. Enfield's customized collection of more than 100 online reference books in arts, biography, business, education, environment, health, history, law, literature, medicine, nation and world, religion, science, social science, and technology. Contains informative abstracts and searchable full text for more than 1,290 popular nonfiction books. The database includes high interest titles on animals, weather, holidays, Native Americans, United States, Canada, biographies, civics and more. Contains informative abstracts and searchable full text for more than 3,100 popular nonfiction books. The database includes high interest titles on careers, health, ethnicity, disabilities, technology, biographies, history, science, women, civics and more. For Genealogists of all levels, Ancestry Library Edition provides users with access to the premier genealogy database. Access includes use of the U.S. Census, Immigration and Naturalization Records, as well as UL census information. Genealogical database with over 25,000 family histories, complete U.S. Census records between 1790-1940, and information on American culture. A comprehensive treasury of American genealogical sources—rich in unique primary sources, local and family histories, convenient research guides, interactive census maps, and more. A powerful online reference system accessible via the Internet. It offers a variety of proprietary full text databases and popular databases from leading information providers. A multi-disciplinary database providing full text and indexing and abstracting for more than 12,000 total publications. Coverage encompasses all aspects of academic study and general interest subject areas. In addition, the database also offers over 440,000 photos, maps and flags and more than 17,500 company profiles. MainFile is updated daily on EBSCOhost. A sophisticated yet simple solution for managing a wealth of periodical, reference, multimedia and primary source information. Discover a collection of authoritative periodicals, scholarly journals, newspapers, and reference content. Business, history and newspaper database. Enjoy easy access to more than 45,000 titles for both adults and juveniles as well as best-selling and highly-recommended titles from industry leading publishers. 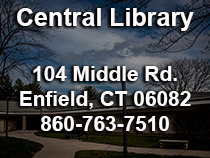 Directory of resources provided by the Connecticut State Library for Connecticut residents. Connecticut's Research Engine powered by EBSCO to in an easy-to-use and powerful search engine. Providing populations in need of vital information and training with tools they can use to become successful grant seekers. Offering free access to Foundation Center’s detailed information on grant makers and applying for grants. Foundation Directory Online - Connect with funding opportunities to make a real difference. Foundation Grants to Individuals Online - Find funders that provide scholarships, fellowships, and more. Foundation Maps - See who's funding what and where around the world. Look up license, permit, certification or registration information on professionals registered in the state of Connecticut. Recommended for looking up physicians. PubMed comprises over 26 million citations for biomedical literature from MEDLINE, life science journals, and online books. PubMed is a free resource that is developed and maintained by the National Center for Biotechnology Information, at the U.S. National Library of Medicine, located at the National Institutes of Health. A comprehensive collection of more than 450,000 full text biographies, including the complete full text run of Biography Today and Biography Magazine, as well as thousands of narrative biographies. Learn about U.S. and World History. Access more than 113,000 historical photos and maps; 77,000 biographies of historical figures; 57,000 historical documents; 1,620 reference books from leading history publishers; 150 history periodicals and 80 hours of historical video. Morningstar provides data and analysis on over 41,000 investments. It also contains screening tools for stocks, mutual funds, and ETFs, articles and videos on investing and personal finance, saving calculators, and more. Access financial information for over 3,500 stocks. Invest with confidence using statistical analysis, graphic indicators, and projection tools. In partnership with Mango Languages, Little PIM offers children a quality online language learning tool that features an animated Panda to make learning a foreign language fun and easy. Mango Languages is an online language-learning system teaching actual conversation skills for a wide variety of languages. Mango uses real-life situations and actual conversations to more effectively teach a new language. By listening to and repeating after material designed from native conversations, you'll not only learn the individual words and phrases, you'll know how they're used in practical situations and conversations. Providing online full text for many of the top consumer legal reference books, with more than 310 full-text publications and thousands of legal forms. Many of the full-text legal reference books are provided through Nolo, the nation's oldest and most-respected provider of legal information for consumers and small businesses. This database offers the everyday user the necessary tools and detailed “how-to” instructions to independently address a wide-range of legal issues including business law, financial planning, family law, real estate and rights and disputes. Includes access to electronic law books and legal forms by state. From ResearchIt CT, an offering of popular digital magazines including: The Atlantic, Bonjour, The New Yorker, People, Popular Mechanics, Ebony, Esquire, Rolling Stone, Saturday Evening Post, Good Housekeeping, Time, Men's Health and more! Provides access to the five most respected US national and regional newspapers, including The New York Times and Washington Post, co-exclusive access to The Wall Street Journal, and exclusive access to Los Angeles Times and Chicago Tribune. The content is available by 8am each day and provides archives stretching as far back as 1985. ¿Estás aprendiendo Inglés? Tome cursos de aprendizaje de idiomas en el equipo. Configurar un perfil para relizar un seguimiento de su progreso. Offers well-researched information covering all aspects of human impact to the environment. Its collection of scholarly, government and general-interest titles includes content on global warming, green building, pollution, sustainable agriculture, renewable energy, recycling, and more. The database provides indexing and abstracts for more than 384,000 records, as well as, Open Access full text for more than 4,700 records. Focuses on key concepts taught in school classrooms including applied science, earth science, life science, physical science, scientists and space science. Complete biographical and bibliographical information and references on more than 120,000 U.S. and international authors. Sketches typically include personal information, contact information, career history, writings, biographical and critical sources, authors' comments, and informative essays about their lives and work. High School - This robust collection includes more than 11,000 titles including classic literary works, important historical documents, general reference materials and curriculum resources for educators. K - 8 - Interdisciplinary collection of more than 14,000 e-books. Students will appreciate the full-text e-book coverage to support their curricula and educators will welcome the access to curriculum guides and other time-saving resources. Cricket - Support students in grades Pre-K through 8th with this e-book collection containing more than 700 e-books developed by Cricket Media, an internationally recognized education company with award-winning content for children, families and educators. The most complete collection of full-text reference resources available for elementary schools. It consists of four database designed to promote both student and educator success. This package offers the most comprehensive collection of full-text reference resources available for high schools. Consisting of six databases to support classroom success, it is designed not only for students, but also for the research needs of educators. OneSearch for elementary schools searches simultaneously all content in researchIT CT considered to be most useful to elementary school students of Connecticut, using one search interface and a unified index of all content. OneSearch for middle schools searches simultaneously all content in researchIT CT considered to be most useful to middle school students of Connecticut, using one search interface and a unified index of all content. OneSearch for high schools searches simultaneously all content in researchIT CT considered to be most useful to high school students of Connecticut, using one search interface and a unified index of all content.